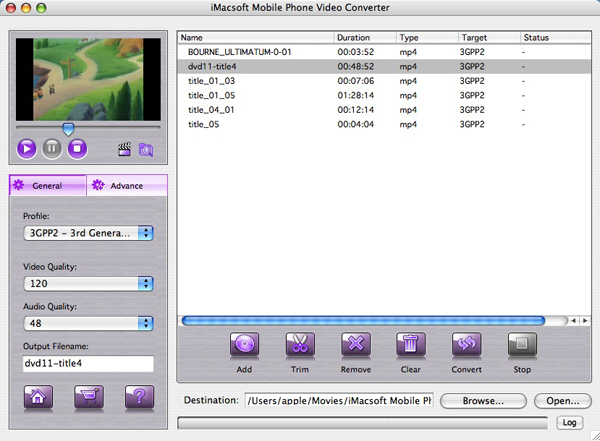 iMacsoft Mobile Phone Video Converter for Mac is a powerful and easy-to-use Mac Video to Mobile Phone Converter designed just for Mac OS X (including Mac OS X 10.10 Yosemite, Mac Intel and Mac PowerPC) users. The Mac Video to Mobile Phone Converter can convert regular video formats to 3GP, 3GPP, 3G2, MPG, MPEG, MPEG2, MP4, AVI, WMV video formats and WMA, MP3, AAC, M4A audio formats for Apple iPhone 3, iPhone 4, iPhone 5, iPhone 5S/5C, iPhone 6/6 Plus, iPad, iPad 2, the new iPad, iPad mini, iPad 4, iPod, Sony PSP, Palm, Pocket PC, and various brands of cell phones including LG, Motorola, Nokia, Samsung, Sony Ericsson and other popular mobile phone players. The excellent Mac Video to Mobile Phone Converter provides more parameters like bit rate, frame rate, and channel to set for personalized conversion. With iMacsoft Mobile Phone Video Converter for Mac, you can rename the output file, trim your loved videos and watch them with all popular mobile phone players anytime and anywhere. Enjoy your favorite video on your mobile phones and players with iMacsoft Mobile Phone Video Converter for Mac right now! How to transfer video to mobile phone on Mac?